The Annual Conference of China Scientific Instruments (ACCSI) recently recognized Micromeritics' TriStar II Surface Area and Porosity Analyzer as one of the leading new instruments introduced to the China marketplace in 2009. The ACCSI 2010 is hosted by the China Instrument Manufacturers Association, China Instrument Society Analytical Instrument Society (CISAIS), China Association for Instrument Analysis (CAIA), and instrument.com.cn. CAIA, supported by the China Ministry of Science and Technology, is a nationwide professional association of institutes and other organizations for instrumental analysis and related fields. Instrument.com.cn, founded in 1999, is the largest website in China focusing on the Chinese analytical instrument market. ACCSI invited 50 experts nationwide (primarily laboratory managers from leading universities and national research institutes) to evaluate various kinds of analytical instruments. After evaluation of analyzers from many different suppliers, this panel of experts voted the Micromeritics TriStar II as one of the 10 best new instruments of 2009. The TriStar II is a fully automated, three-station, surface area and porosity analyzer capable of increasing the speed and efficiency of quality control analyses, while having the accuracy, resolution, and data reduction required for most research needs. The instrument combines versatility in analysis methods, data reduction, and reporting to allow the user to optimize analyses to specific applications. The TriStar II features a dedicated saturation pressure port, allowing the measurement of saturation pressure on a continuous basis. Three analysis ports operate simultaneously and independently of one another. 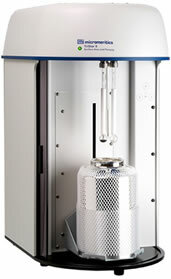 In addition, a high-vacuum option allows measurements using krypton gas in the very low surface area range.